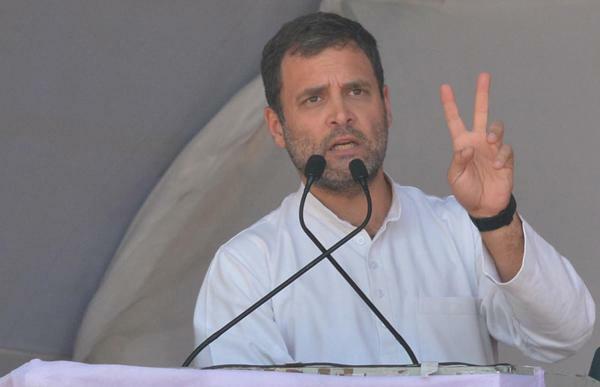 Congress president Rahul Gandhi Wednesday filed his nomination for the Amethi Lok Sabha seat, flanked by family members during a road show and at the local collectorate in an event meant to show that the Gandhis cared for their bastion. The three-time Amethi MP was accompanied by UPA chairperson and mother Sonia Gandhi, sister Priyanka Gandhi Vadra and brother-in-law Robert Vadra as he filed his papers. The two Vadra children were also part of the road show, through streets lined with Congress supporters, which ended at the collectorate. Local leaders said the presence of the three generations of Gandhis was meant to convey the message that the constituency was important to the family. In a tweet, Priyanka Gandhi, who is the Congress in-charge for eastern Uttar Pradesh, recalled her father and former prime minister Rajiv Gandhi's association with Amethi. "Some relationships are from the heart. Today, the whole family was present for my brother's nomination. This was my father's 'karmabhoomi', it is sacred land for us," she tweeted. Rahul Gandhi came to Amethi buoyed by a Supreme Court order on the Rafale deal earlier in the day. The court has allowed leaked documents to be taken into account when it hears a review petition on a judgment that had given the government a clean chit in the Rafale deal. Speaking to reporters, he claimed the apex court order had made it “clear” that there was corruption in the fighter jet deal and challenged Prime Minister Narendra Modi to a debate on it. Less than a week earlier, the Congress president had filed his papers from a second constituency – Wayanad in Kerala – prompting the BJP to charge that he was “fleeing” from home turf Amethi. The Gandhis and other party leaders travelled three kilometres in an open vehicle, and were showered with rose petals and marigold flowers. Congress workers surged around the truck, some of them wearing shirts which promoted ‘Nyay' – the promised minimum income scheme that the party hopes will help propel it to power. Rahul Gandhi is expected to face a tough fight in Amethi from Union Minister and BJP nominee Smriti Irani. In 2014, he defeated her by a shrunken margin of about one lakh votes, and the BJP leader has been nursing the constituency since then. It is virtually a Gandhi versus Irani fight as the SP-BSP-RLD opposition alliance in Uttar Pradesh has decided not to field a candidate on the seat. The procession made its way to the collectorate through Munshiganj, Darpipur and Gauriganj, as supporters braved the heat to get a glimpse of Congress leaders. People lined both sides of the road, cheering Rahul Gandhi who waved back. The route was lined with Congress flags and hoardings with pictures of Rahul Gandhi and Sonia Gandhi. Some banners read 'Vikas ki aandhi, Priyanka Gandhi' and 'Amethi ka saansad, desh ka PM'. Party workers raised slogans and sometimes broke into an impromptu dance to the beat of drums.Enthusiastic youngsters on motorcycles moved around making videos of the event on their mobile phones. Outside the collectorate, even Priyanka Gandhi was seen taking ‘selfies' with her children. UPA chairperson Sonia, who was not part of the road show, reached the collectorate separately to back her son. She will file her own nomination papers from neighbouring Rae Bareli Lok Sabha constituency on Thursday. BJP's Smriti Irani will file her papers on Thursday, when Uttar Pradesh Chief Minister Yogi Adityanath is scheduled to hold a road show on the same route and address a public meeting in her support. Amethi goes to polls on May 6 in the fifth phase of the Lok Sabha elections. The BJP has accused Rahul Gandhi of not doing enough for the constituency's development, claiming their own candidate was always there for the people there. "Amethi is all set to write history this time and people are all set to bid goodbye to Rahul Gandhi," local BJP Rajesh Agrahari claimed. BJP leader Bindeshwari Dubey told PTI, "As Smriti Irani has remained connected with the constituency, the jittery Congress MP has been forced to contest from Kerala." But Congress leader Dipak Singh rejected the charge. "Smriti Irani's arithmetic is all wrong,” he said, claiming that Smriti Irani has come to Amethi only 15 times, spending just hours here. But Rahul Gandhi, according to him came to the constituency 35 times during the last five years, spending two or three days each time. Congress district unit spokesman, Anil Singh has claimed that Irani comes to the constituency only for “time pass” and has laid false claims to the work done by the Congress. Opinion is divided on whether the Congress has done enough for the constituency which elected Sanjay Gandhi in 1980. After his death in an air crash, Rajiv Gandhi was elected from here. Sonia Gandhi represented the constituency from 1999 to 2004. Rahul Gandhi first won an election from Amethi in 2004. “Does this look like a VVIP constituency," said Sabharaj of Tiwaripur village said, pointing at the “lack” of development. But farmer Ravindra Misra criticised the BJP government over fertiliser prices and electricity charges. He was also upset with the damage to his crops by stray cattle. In the 2017 assembly polls, the BJP won four of the five seats under the Amethi Lok Sabha constituency. The fifth went to the Samajwadi Party.